The Trinity College Foundation annual fundraising dinner with silent auction. Enjoy a three course meal with accompanying wines. Tickets remain at 2017 prices of $150.00 per person. Telephone the Foundation Office on 8523 8754 for table bookings and tickets. Download a flyer here. On Friday 3 August, the 2018 Trinity College Foundation Gold Gala Dinner once again attracted a diverse cross-section of our community who gathered in the Ian McLachlan Room at the Adelaide Oval to enjoy this special occasion. Read a full account of the evening's festivities here. 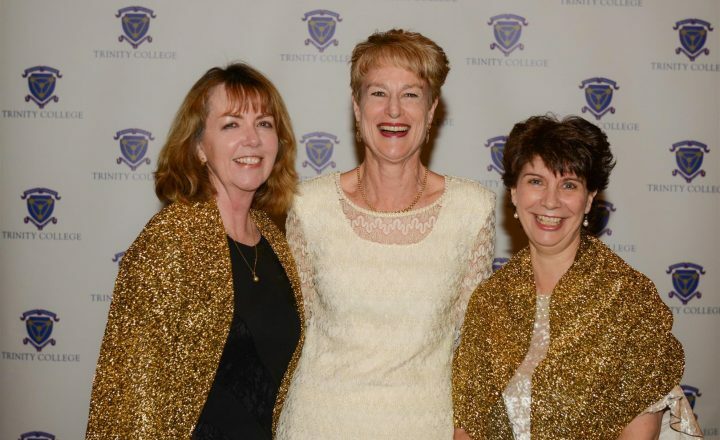 The Foundation Board is pleased to announce that the 2018 Trinity Foundation Gold Gala Dinner raised $35,437.50. The Foundation Board extends their thanks to all donors and volunteers who made the night such a success as well as the Trinity families who donated items towards hampers and baskets that generated $1,247.00 in the silent auction. The Trinity Foundation hosted the second Frocks & Fascinators Luncheon in the Pavilion on Tuesday 6 November. The fundraising event attracted 60 guests who all embraced the Melbourne Cup theme. Catering and service for the lunch was provided by Year 10 North Semester 2 Catering students and the menu featured produce from the College farm, North Kitchen Garden and Plant Grow Garden. With raffle prizes and a few sweeps for entertainment, our guests loved the opportunity to see our students in action preparing a three course meal. The students excelled at being chefs, kitchen crew and waiting staff. They greeted guests with a warm smile and no dietary request was too difficult for them to handle. 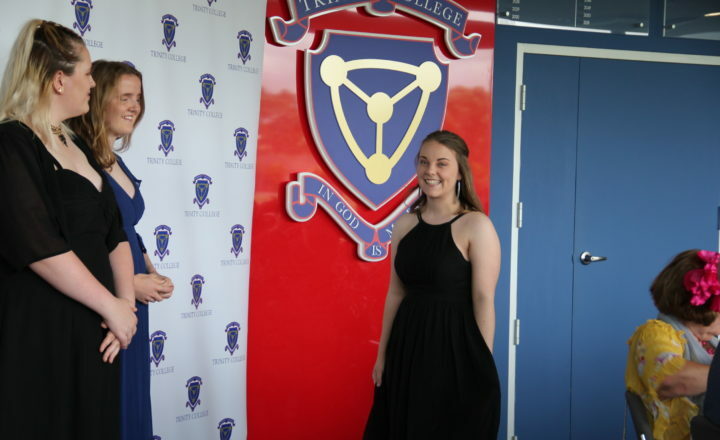 Another highlight of the afternoon was a fashion parade of gowns worn by Year 11 students at the recent annual Presentation Ball. With such a festive atmosphere, our visitors were very keen to stay and enjoy more of the Trinity hospitality. 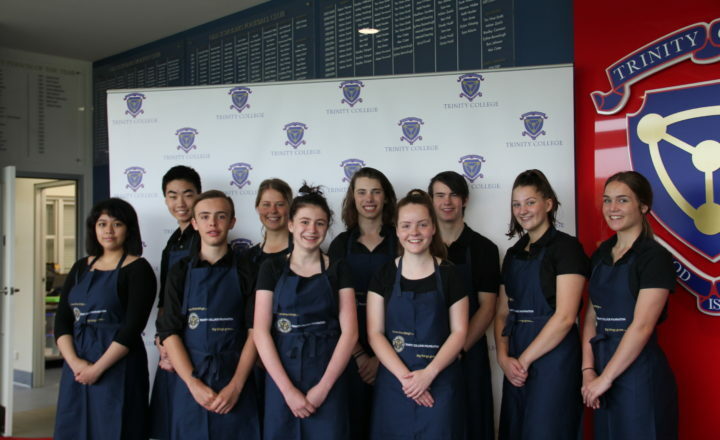 Well done to these students who helped raise monies for the Foundation Scholarship Program. The Trinity College Foundation offers a number of scholarships to students both internally and externally. Visit the Scholarships webpage for further information and application forms. The Certificate of Academic Merit is presented to students who make significant improvement in academic areas. The award is designed to recognise and promote academic achievement and is intended to complement other forms of recognition by acknowledging students who might not otherwise be recognised. A total of 16 certificates are presented in Term 3 annually across the College Middle Schools. Each recipient also receives a commemorative book. The Foundation supports Trinity College students to attend Operation Flinders a is a South Australian based charitable organisation that runs a world leading wilderness adventure program for young offenders. The program takes participants between the age of 14 and 18 years on an eight day exercise in the far northern Flinders Ranges, providing an opportunity for its participants to break away from their past and grow as valued members of the community. Each year the Foundation presents Citizenship Awards to students from all five schools for their overall contribution to the College through personal dedication, strength of character and good citizenship. Recipients may have made outstanding contributions in academic effort and success, sporting contributions and participation, cultural and worship endeavour, House involvement and general leadership and community service outside the College. The Spirit of Trinity Fund supports students in a tangible way to continue their schooling at Trinity College. Examples of support are, but are not limited to, uniforms, textbooks, stationary, learning tools, subject related excursions, counselling/professional support and emergency care. Since its inception in 2013, we have supported 86 students at a cost of $35,000.